Concordia University has expanded its Comfort Dog Ministry by four more furry paws. This past August a 2-year-old purebred Golden Retriever named Sage joined Concordia’s inaugural comfort dog Zoey. Together, the two serve as an emotional support on campus and beyond through their ever-patient demeanors and calming presence. Like Zoey, Sage is a Lutheran Church Charities (LCC) K-9 Comfort Dog. He’s owned by the university—thanks to the support of generous donors—and works full time, logging between 35 to 40 hours in an average week. He even has office hours, a uniform, business cards, and a Falcon 1 card. While Zoey’s primary role is to assist in Concordia’s Counseling Center, Sage focuses his efforts on the School of Health Professions, working with students in the animal assisted therapy certificate program, which launched this fall. Three physical therapy and seven occupational therapy students are among the university’s inaugural cohort for the program, which requires the completion of seven courses and 225 hours working closely with certified comfort dogs. Most of those hours will be spent serving in Concordia’s three new Health Professions clinics: the Speech, Language and Hearing Clinic, which will be located in CUW’s new academic building; a community-based clinic located in Granville Lutheran, a LUMIN school in Milwaukee; and a second community-based clinic located in Portal, Inc., a nonprofit organization in Grafton, Wisconsin, that serves adults and youth with developmental disabilities. Partnerships with the two community clinic sites were finalized in time for the start of the fall 2018 semester. CUW students studying physical therapy and occupational therapy now offer free services at the sites about once a week, and Sage frequently accompanies the students on their visits. Other schools throughout the nation offer animal assisted therapy certificate programs similar to the one that Concordia has piloted, but Sage sets CUW apart from the rest. 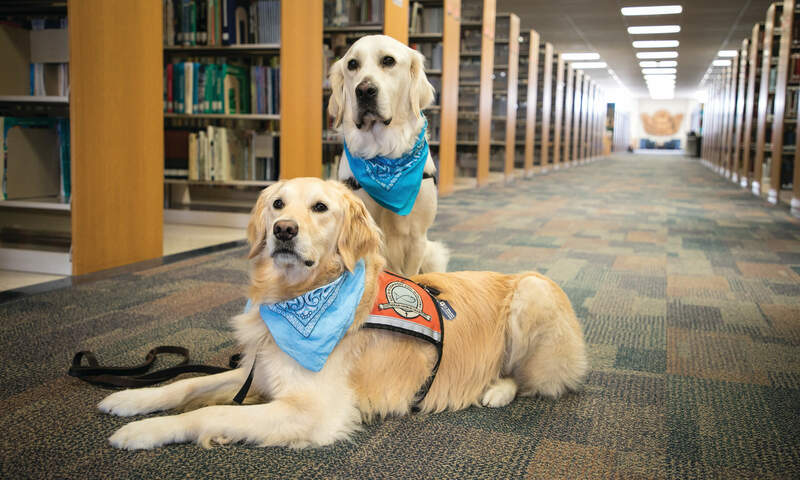 Sage and Zoey also devote their working hours to serving in the community and educational settings; deploying to national tragedies; and being at large in the university to serve as a calming presence to students, faculty, and staff in passing. Dave Enters, director of counseling and head of the Counseling Comfort Dog program, says it’s impossible to miss the impact that comfort dogs have on Concordia. Follow Sage and Zoey on Facebook at /SageComfortDog and /ZoeyComfortDog. Learn more about Concordia’s Health Professions offerings at cuw.edu/healthprofessions. Offer your financial support for the animal assisted therapy certificate program at cuw.edu/give.